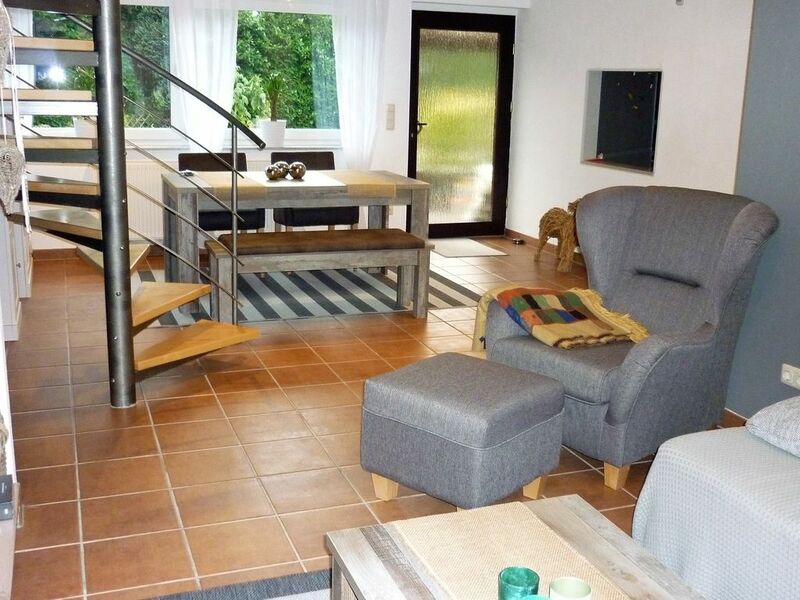 Our newly renovated small cottage is located in the southeast of the sprawling Niederrhein but also in the relaxing green north of the Ruhr area. A quick accessibility of many major cities but also peace and relaxation in our Rotbachtal are given. Our house is located directly on the forest area at the nature reserve Kirchheller Heide with miles of cycling and hiking trails. Several parking spaces can be reached via the own driveway through a gate. The largely unspoiled completely fenced plot of approximately 450sqm connects to the entrance area with the 65sqm large terrace. It is mowed regularly. The covered large terrace on the other side of the house is also fenced. On approximately 80 square meters, for sole use, it awaits on the ground floor, next to the spacious hall and storage room, a large kitchen, a guest toilet and the living-dining area. From there they reach the attic, where the bedroom and behind the shower room is located. There is a covered terrace at the back of the house and is accessed from the living room. In the kitchen there is a dishwasher, microwave, an electric stove with oven and a fridge-freezer. There is also a kettle, toaster and a coffee machine. Of course, all necessary kitchen utensils and a selection of spices in addition to flour, sugar, vinegar and oil are available. The couch in the living area can be transformed into a fully-fledged sleeping area with a width of 160 cm. There is a satellite TV, DVD player, and a radio / CD player. Some board games and books are available. The double bed has the dimensions 180 x 200 cm. The delivery possibility of a cot or a simple additional sleeping (seat cube, lying area 70x195 cm) is possible by arrangement. Among other things, a virtual tour can be seen on our homepage. z. B. CentrO, gasometer Oberhausen, ski hall Bottrop, tetrahedron, Zoom Erlebniswelt Gelsenkirchen, Movie Park, sailing airport Schwarze Heide, many museums, industrial culture in many places. It's too much to list. wir waren absolut begeistert, ein solch sauberes, einladendes, warmes und modern eingerichtetes Haus vorzufinden. Wir waren sehr zufrieden mit der Gastgeberin und dem gebotenen Quartier. Freundlichkeit und Sauberkeit ließen keine Wünsche offen. Vielen lieben Dank für die tolle Bewertung. Sie waren absolut angenehme Gäste, die ich jederzeit gerne wieder begrüßen würde.